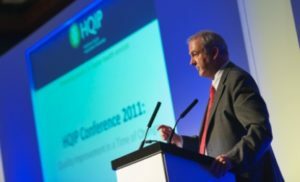 HQIP / Blog / Sir Bruce Keogh: What is the first national MD’s quality improvement legacy? This week we have learned that Professor Sir Bruce Keogh is to step down from his position as NHS England medical director. But before we reflect on the impact of the first the national MD in England, I should begin by offering some personal reflections from myself and organisationally on behalf of HQIP and our partners. Bruce has been a great friend and has offered unwavering support to me and to the belief that interventionalists should have information on their outcomes and should clearly articulate these outcomes to their patients and colleagues. It’s a thread that runs throughout Bruce’s career taking forward Ian Kennedy’s articulation, following the Bristol Royal Infirmary enquiry, that transparency in outcomes and results is fundamental to the being a doctor. A cardiac surgeon by trade, he went on to become President of the Society of Cardiothoracic Surgeons and had a significant impact in developing the cardiac clinical audits – helping create a culture where it was clear surgeons should be aware of and open about their results, which saw individual clinicians’ results made public for the first time. As I Tweeted, Bruce really did offer unwavering support for national clinical audit and registries, and the quality improvement that falls out of these. This, in turn, has empowered HQIP and those we commission, in partnership with clinicians at the coal face, to do what’s really important – to measure outcomes and process, and tangibly improve care for patients. The work which began as publishing individual clinicians’ results has now expanded enormously via the Clinical Outcomes Publication (COP) programme. Delivered by HQIP for NHS England, this now incorporates 19 specialties reporting at individual and unit-level. Available on NHS Choices and MyNHS, this not only offers healthcare professionals assurance, it is enormously popular with patients, providing great information and reassurance on the care they are likely to get. This is one way in which Bruce has met the ‘Transparency Agenda’ challenges set by various government administrations during his tenure. He is the first national medical director – the first national director from the ‘delivery arm’ of healthcare in England so to speak – and has been a hugely successful conduit between government and clinicians. A tricky balance to strike, but he’s managed that, with clinical effectiveness and patient safety the clear line he has led. And this balance has been struck during challenging times of course, but, certainly in the projects I and HQIP have worked with him on, he has never shied from that challenge. Across the four years of COP, we have held annual events with clinical leaders, and these have not been without robust debate. Bruce not only presented at each of these, but he very much made himself available to colleagues, staying for Q&A sessions and to discuss more informally afterwards. He listened to feedback for sure, but he also played a strong role in helping us all reflect on how this is right for patients and it improves the offer we provide them with. A cynic could call this lip-service, perhaps argue this is all part of the day job. But to those who care about quality improvement (and it goes without saying that should be all of us), I can tell you personally that Bruce cares deeply about it and remains convinced of its efficacy. One simple anecdote on this from me: just last month, we met with Bruce. Once the formal business of the day was done, he was keen to mention he’d not received hard copies of one of the recent national clinical audit reports and wanted to make sure he could get it, telling us how he looked forward to getting them and read them all. Pleasing and reassuring to hear, I’m sure you’ll agree. I’m delighted Bruce is staying in the business, Chairing a crucial new organisation in the Birmingham Women’s and Children’s Foundation Trust. This first national medical director has set a clear benchmark, in looking directly to clinical audits and registries to measure and improve clinical effectiveness and to outcome review programmes for patient safety, and I’m sure the next incumbent will take the baton smoothly. We look forward to working with them as we keep seeking to improve care for patients.